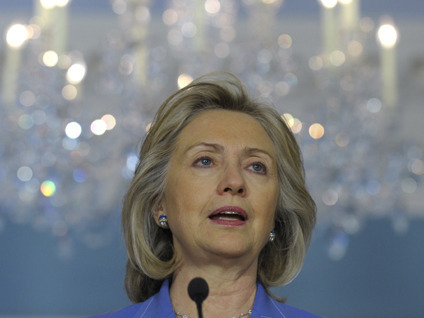 Secretary of State Hillary Clinton is once again shooting down the idea she will run for president in 2012 or 2016. While in New Zealand as part of a two-week Asia-Pacific tour, a reporter on Friday asked Clinton whether she had ruled out running for the presidency through 2016, according to the Associated Press. "Oh yes, yes," Clinton replied. "I'm very pleased to be doing what I'm doing as secretary of state." In a separate interview with TV New Zealand, Clinton said the United States "should be" ready for a female president, but that it would not be her. "But it will be someone, and it is nice coming to countries that have already proven that they can elect women to the highest governing positions that they have in their systems," she added. New Zealand has had two female prime ministers. Clinton has said repeatedly she has no intention of running for president again, but that has not stopped speculation or interest in the idea. A Gallup poll in September showed that more than a third of Democrats would support Clinton were she to challenge President Obama in the primaries for the 2012 election. The first 2012 presidential ad was even in support of Clinton. Clinton and the White House have also had to shoot down rumors that she would replace Vice President Joe Biden on the 2012 ticket.